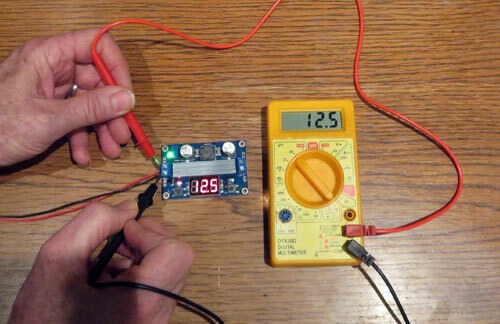 A quick and easy way to get variable voltage from a fixed voltage DC power supply is to use a commercially available adjustable voltage converter module. 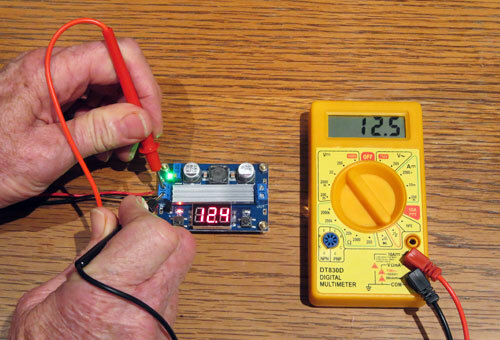 This is a convenient and inexpensive solution for powering electronics projects. One of these modules can easily be connected to the output of a DC bench supply or even a salvaged AC adapter that may be lying around. Different modules are available for either stepping up or stepping down voltage. 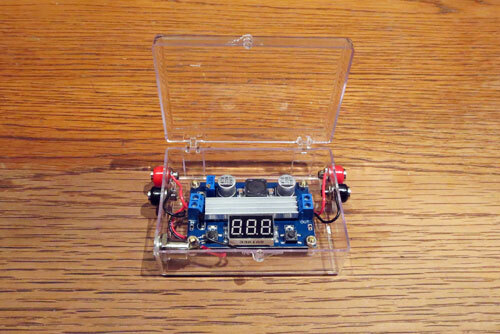 Some units also come with a built in voltmeter like the one pictured above. These units are sometimes available with optional heat sink and/or mounting hardware (circuit board standoffs and nuts). The unit shown in the photo above came with a heat sink. It’s been my experience that it is best to buy these units with the mounting hardware and heat sink included because it is inconvenient to obtain these items separately. 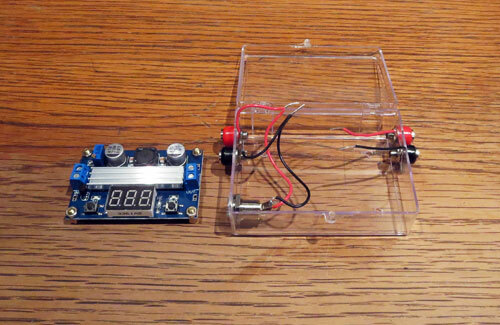 In this example I assembled the unit in a rigid clear plastic box with a hinged lid so the voltmeter is always visible and the hinged lid allows me access to the unit. 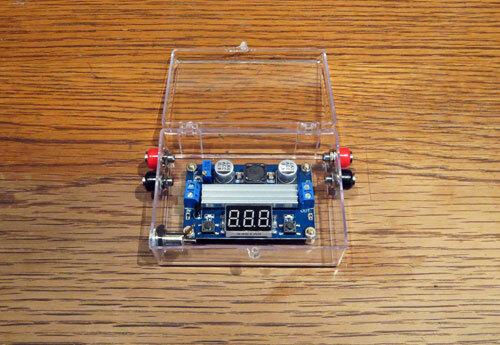 This unit is a “100w 35v adjustable boost voltage module”. 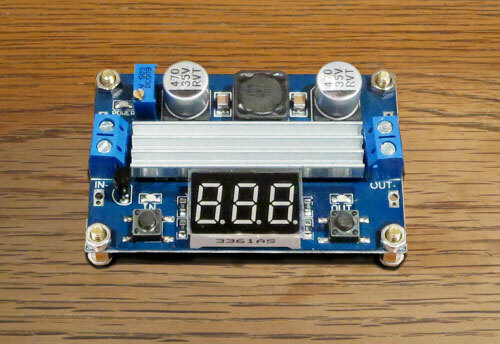 Input voltage range is 3-35v and output voltage range is 3.5-35v DC. This unit also has a calibration function, which had to be done in my case. The heat sink is affixed with double sided “peel and stick” thermal adhesive tape (e.g. 3M™ 8810 or Sony™ T400). Output voltage is adjusted with a trimmer pot and buttons are provided for switching the voltmeter display from input to output and for calibrating the unit. 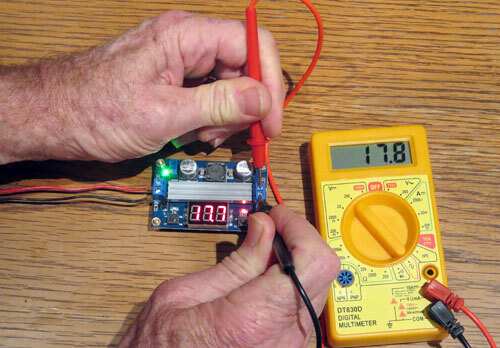 The first thing I wanted to do was to check the input and output voltages with a multimeter. The input is on the left and the output is on the right. A green LED on the left lights up when the unit is powered up. A red LED on the left lights up when the voltmeter displays the input voltage. The input voltage is a little bit off. 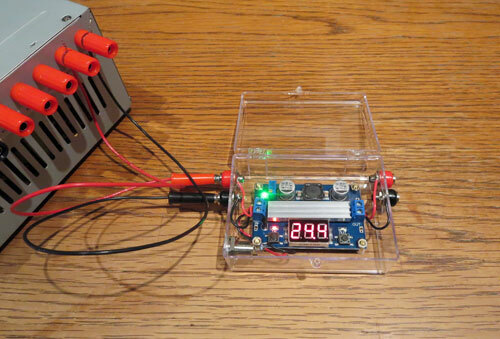 A red LED on the right lights up when the voltmeter displays the output voltage. The output voltage is also a little bit off. The unit needed to be calibrated. 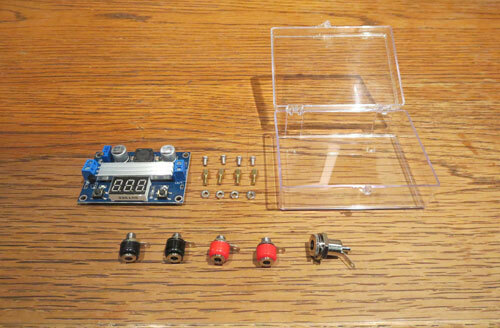 Shown below is a photo of all the parts for the build – back row: adjustable boost module, mounting hardware, plastic box (3 9/16″ x 2 9/16″ x 1 1/8″) front row: 2 black banana jacks, 2 red banana jacks and a 2.1 mm coax panel mount DC power jack. Note: There are two different power inputs, banana jacks and a DC power jack. Technically, there should be an SPDT switch between them to be able to select either of the two inputs while excluding the other. But for simplicity I chose not to add a switch. Just remember not to input power from two different sources at the same time. I used a pencil to trace the hole pattern from the unit onto a sheet of paper. 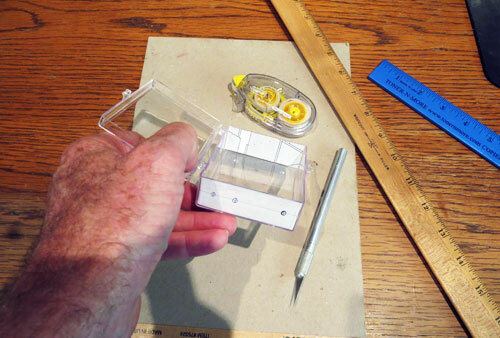 Next I drew an outline for positioning the clear plastic box. 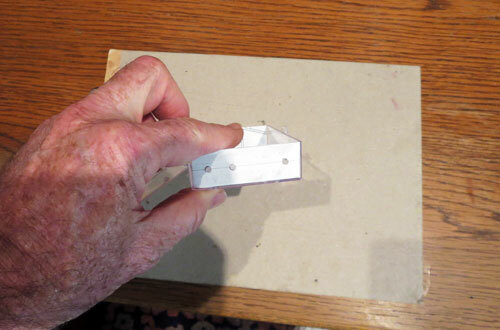 Then I positioned the box over the paper and taped it down so the markings for the holes were clearly visible. This made it easy to drill the holes. There is a block of wood under the paper to protect the desktop. I used a fresh, sharp 1/8 in drill bit to drill the holes. Note: Drill very slowly and with mild pressure. 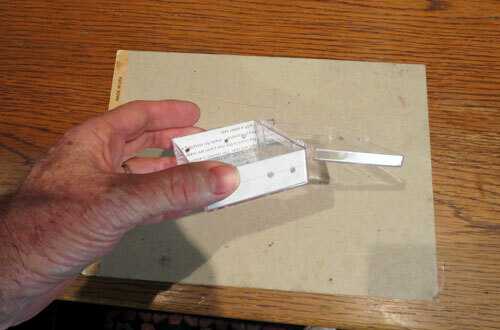 The box is made of styrene plastic and is very brittle. It cracks very easily. You will need to use a variable speed drill. 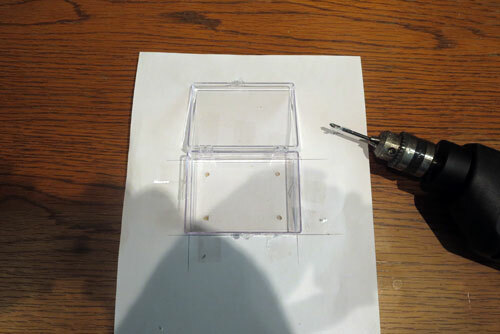 Use a 1/8 inch drill bit to drill all the holes. Then enlarge the holes with a taper reamer until the parts fit. You might also try to gradually increase the drill size but the clear plastic may crack. 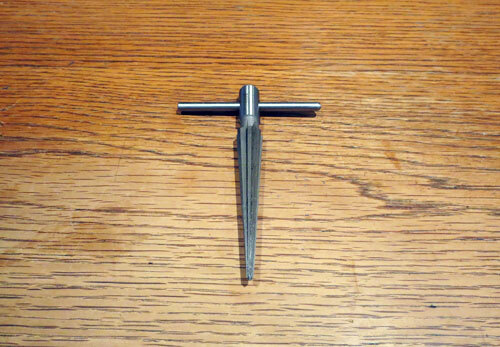 The taper reamer was very easy and was less likely to crack the plastic. For the end panels I drew the hole layouts on paper, then cut them to the size and shape of the end panels. I used a roll on glue tape dispenser with repositionable adhesive to affix them to the insides of the panels. I used the same 1/8 inch drill bit to drill the remaining holes. Shown below is the output side with two holes. This is the input side with three holes. Then I used a taper reamer to enlarge each hole one by one. The material is soft. It goes very fast and easy. This is the safest way to prevent cracking. Next I mounted all the parts into the box and checked to make sure everything fit and all the holes lined up. I had to adjust the bottom holes a little bit with a precision utility knife with a No. 11 blade (visible in a previous photo). Remove all the parts before soldering the leads. Using 24 gauge stranded wire, I soldered red and black leads to each of the parts, then re-mounted them back into the box. Red wires are for the positive leads and black wires are for the negative leads. The center post in the 2.1mm jack is for the positive (red) wire. I connected the leads to the screw terminal blocks on the pc board and mounted the board to the base of the box with the mounting hardware (standoffs, nuts and screws). The standoffs and nuts were M3 (3mm dia threads). The screws were M3 x 5mm Phillips. The unit is complete and ready to use. I checked the 2.1mm DC power jack with a 12v AC adapter. 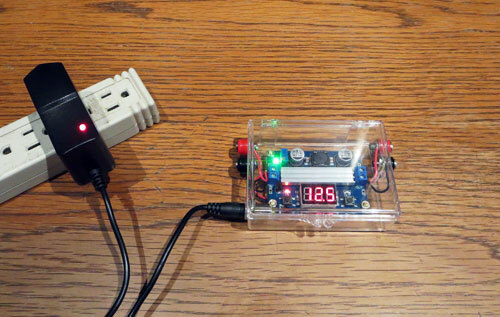 The input voltage is displayed on the voltmeter in the photo below. The next check in the photo below was to make sure that the banana plug inputs were working. 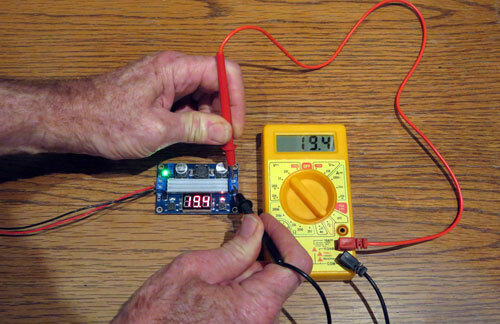 The voltmeter in the photo below shows the input voltage. The unit is ready to go. 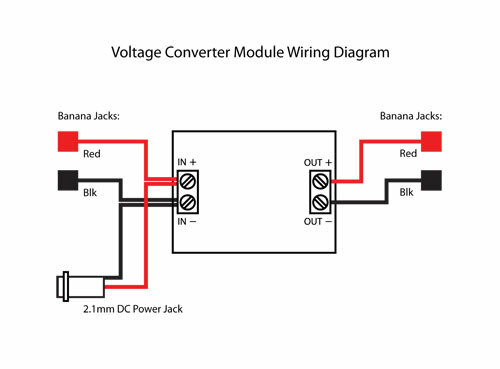 All you have to do is connect red and black leads with banana plugs into the positive and negative output jacks and connect them to your devices or circuit boards. Use the trimmer pot to adjust the voltage up or down as needed. Just make sure the current draw doesn’t exceed the current capacity of the AC adapter or bench supply that you are using as a power source. The boost module circuit itself draws only a small amount of current.